[Extinct Town] The strategic town was occupied until a smallpox epidemic in 1738-39 when it was abandoned and briefly reoccupied in 1756 by French-allied Cherokee from Great Tellico. The town became a point of refuge during the 1776 Virginia Expedition to attack the Cherokee Overhill towns along the Little Tennessee River. They attacked again in 1780 and purposely targeted Hiwassee Old Town because of their affiliation with the "Chickamauga" Cherokee. John Sevier's Tennessee Militia destroyed the town in 1788. Today the area is known as Savannah Farm and the old town was on both sides of U.S. Highway 411. The area is under the control of the Tennessee Department of Agriculture, Forestry Division, East Tennessee Nursery. A forty-acre area is a designated archaeological preserve and Mississippian-period mound and village site. Go to the Forestry office in order to get the best perspective of the area of Hiwassee Old Town. [Extinct Town, Private Property] Columbus emerged out of U.S. Secretary of War Henry Dearborn’s 1806 Treaty with the Cherokees. 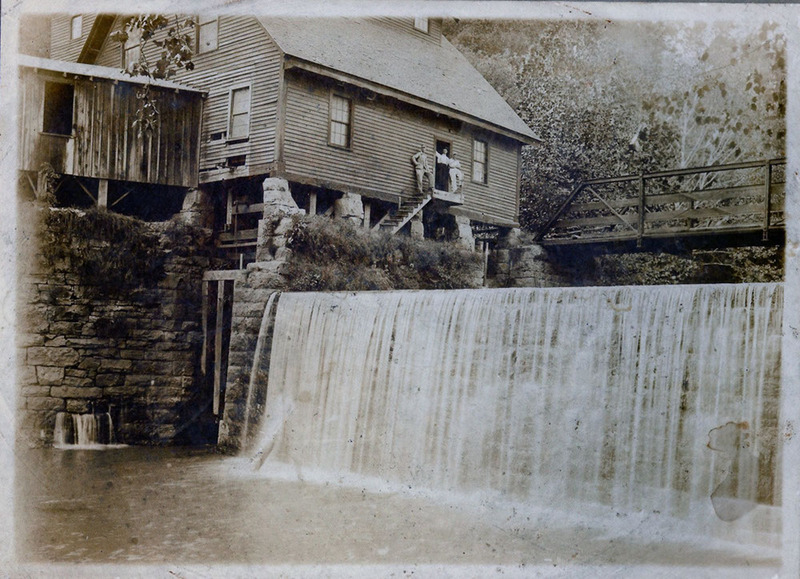 One of considerations stipulated that a grist mill would be built with a year of the treaty going it effect. The site agreed upon was one mile north of the Hiwassee River on Conasauga Creek and the U.S. Government sent German emigrant John Hildebrand from Knoxville to build and run it. After the 1819 Hiwassee Purchase, Columbus became a six acre town, being the merging point of the Indian War Path and the Federal Road and crossing point of the Hiwassee River. It was the first incorporated town in Polk County, briefly served as the county seat, however, Benton was chosen as the country seat in February 1840. By 1855, Columbus was in significant decline and was unincorporated. The American Civil War served as the town’s fait accompli. On the evening of December 8, 1863, the Brigadier General Jefferson C. Davis's Second Division, XIV Army Corps, Army of the Cumberland, arrived from its march to the relief of Knoxville. His division remained until the morning of December 15th. The division fanned out to two other nearby mills and used them to grind corn and wheat they found in the surrounding area to provision themselves. They also deployed mounted patrols into the mountains to successfully hunt down "guerrillas and murders." During the winter and early spring of 1864, the Federals picketed the Hiwassee River from Columbus and Benton to Calhoun orienting both north and south to watch for Confederate forces from upper East Tennessee or Dalton. Little of anything was left. Anything that could be used for building material for pontoon bridges and soldier's housing was torn down and repurposed. The town of Calhoun was formed from the Hiwassee Purchase of 1819 by which the Cherokees ceded their land to the United States. The town was created on a reservation granted to Major John Walker, a Cherokee Chief, who was instrumental in negotiating the Treaty of 1817. The town served as the McMinn County seat until 1823. Several prominent families lived in Calhoun including the family of Cherokee businessman John Walker, Sr., who operated the ferry site [noted below] as well as other businesses in Calhoun. Chief Walker laid out the town and the first court meeting establishing McMinn County was held in his Calhoun home. Border town to the Cherokee Nation, Calhoun was home to Indian Agent and Former Tennessee Governor Joseph McMinn in the early 1820s. It was the original county seat of McMinn County. Several prominent families lived in Calhoun including the family of Cherokee businessman John Walker, Sr., who operated a ferry as well as other businesses in Calhoun. Walker laid out the town of Calhoun and sold land to people who wanted to settle there. The first court meeting establishing McMinn County was held in Walker’s Calhoun home. His detailed will is on file at the McMinn County Courthouse in Athens. Calhoun is located 3 miles east of I-75, exit 36 in McMinn County, north of the Hiwassee River. This site on the Eastanollee Creek was originally the location of a mill owned and operated by Major John Walker, Cherokee Chief and founder of Calhoun. In 1842 the mill was acquired by the McElrath family. Vermont Entrepreneur George Saulpaw purchased the site in 1869 and built an elaborate mansion west of the mill. The mill was torn down by TVA in 1940 as part of flood control along the river. The giant stones of the mill dam were quarried from bluffs up river and transported to the mill site. North Main Street, Calhoun. Joseph McMinn served as Governor of Tennessee from 1815 to 1821, and was President Andrew Jackson’s ally in the effort to remove the Cherokees. McMinn County, which bears his name, was formed out of the Hiwassee Purchase in 1819 as part of Cherokee land sales that McMinn was instrumental in organizing. In 1823, McMinn was made Indian Agent and was stationed at the Agency in Charleston where he died at his desk in 1824. He was a member of the Presbyterian Church and had requested that when he died, he be buried with his feet at the front steps of the church so he could be the first in on Resurrection Day. His grave is marked by a 12-foot tall obelisk in Shiloh Presbyterian Cemetery. From Charleston, take Hwy 11 north to Calhoun. Turn right Hwy 163 (Etowah Rd), then left on N Main. North Main Street, Calhoun. The Cherokee Mission was established circa 1804 by Gideon Blackburn, who was considered the first missionary to the Cherokee Indians. It was located at the current Shiloh Presbyterian Cemetery. This was also the site of the Presbyterian Church which was destroyed by Union troops during the Civil War. From Charleston, take Hwy 11 north to Calhoun. Turn right Hwy 163 (Etowah Rd), then left on N Main. Main Street, Calhoun. Col. Return J. Meigs was a Revolutionary War hero and Cherokee Indian Agent from 1801 until 1823. A marker is located on Calhoun’s Main Street just south of Hwy 163 indicating that at one time his home was in the area. Further research indicates that he lived at the Agency and died there in 1823. Meigs is buried in Rhea County at Garrison Cemetery. The DAR erected this marker in 1930. From Charleston, take Hwy 11 north to Calhoun. Turn right Hwy 163 (Etowah Rd), then right on Main St.
820 Highway 163, Calhoun. Morgan served under General Andrew Jackson is his battles against the Creeks, 1813-1814. Allying with the Cherokee during the Creek War, Morgan was well acquainted with Chief John Ross and other notable Cherokees. He is buried in the Calhoun Community Cemetery where the inscription on his tombstone reads "73 years old". From Charleston, take Hwy 11 north to Calhoun. Turn right Hwy 163 (Etowah Rd), then right on Church St.
820 Highway 163, Calhoun. In the cemetery of Calhoun Methodist Church is the grave of Sarah Elizabeth Ross, the 2-year-old daughter of Cherokee businessman Lewis Ross and niece of Chief John Ross. Sarah took sick and died while the family was living near Calhoun in 1824. From Charleston, take Hwy 11 north to Calhoun. Turn right Hwy 163 (Etowah Rd), then right on Church St. The ferry connected the north and south banks of the Hiwassee River since circa 1806. After the Hiwassee Purchase of 1819, the ferry connected the United States to the Ocoee District of the Cherokee Nation. During the Trail of Tears Removal of 1838, the ferry transported over 3,000 North Carolina Cherokees to Fort Cass, the containment camp across the river. The bridge was constructed in 1842 and was the first railroad in Tennessee. It was a strategic logistical link connecting the Southern industrial belt with Confederate armies both in Tennessee and Virginia. It was burned several times during the Civil War and still rests on the original pilings. A defensive block house was built by the Union Army in 1864 and was located near the ferry site and the railroad bridge on the north and south sides of the river. The first paved road in Tennessee was started as a result of a public meeting held in Athens in 1919. The road between Calhoun and Athens was almost impassible by automobiles of the day so by 1920, with the help of the State Legislator Harry T. Burn to secure funding, construction was begun. This 3,500 foot stretch of road still has much of the original pavement still intact. From U.S Highway 11, turn east onto Tennessee 163 and go approximately 800 feet and then turn north (left) onto Old U.S. Highway 11. Almost 200 years ago, the land around the Hiwassee River was a much different place. The north side of the river was, and still is, Calhoun, located in the United States. The south side of the Hiwassee, present-day Charleston, was a thriving Cherokee community called Walker’s Ferry with missions, farmlands, stores and families. The last federal Cherokee Indian Agency was located here. The Agency (1820-1834) provided protection for the Cherokee people and was akin to a present-day embassy. In prior years (1785 – 1820) and in previous locations, the Agency was responsible for issuing passports for visitors to enter into the Cherokee Nation. The area known today as Charleston was a gateway to the Cherokee Nation. Charleston is located along U.S. Hwy 11, 3 miles east of I-75, exit 33, south of the Hiwassee River. In 1835, the Agency area became Fort Cass, a federal military post. Later, in the fall of 1838, Fort Cass was the scene of one of the greatest American tragedies carried out in history, the forced removal of the Cherokee from their eastern homeland on what is now known as the Trail of Tears. 8746 Hiwassee Street (Hwy 11), Charleston. Discover a compelling story of human spirit and tragic sacrifice. The banks of the Hiwassee River were witness to nationally significant history involving the Trail of Tears and the Civil War. Present-day Charleston was once the site of the federal Indian Agency and eventually Fort Cass, the U.S. military headquarters for the entire Cherokee Trail of Tears removal. The Hiwassee River was a pivotal crossing for troop movement in the Civil War and several officers on both sides of the conflict made Charleston a stop in their operations. Discover these important stories and more at this recently opened interpretive center, designated by the National Park Service as a certified site on the Trail of Tears National Historic Trail. [non-extant]. Fort Cass was a collection of many encampments covering about 30 square miles which included present-day Charleston and stretched toward Cleveland. Fort Cass was the military headquarters for the entire Cherokee Trail of Tears operation. It was one of three major federal emigration depots where Native Americans, mostly Cherokee, were assembled and held under supervision of federal troops. The two other assembly areas were Ross’ Landing in Chattanooga and Gunter’s Landing in Alabama. Within Fort Cass, federal troops headquartered near the heart of the current city of Charleston. Troops used the former Cherokee Agency as part of the military post. Two federally recognized trail routes are traced from the Fort Cass area – the Bell Route which included one detachment and the Northern Route, which included nine detachments. Rattlesnake Springs (NR Listed 1975) served as one of the Cherokee encampments within Fort Cass and is the most famous and recognizable name associated with this area. The springs are located off Dry Valley Road on a privately-owned farm operated by the Moore family since 1850. Henry Benton Henegar served as wagonmaster and secretary under Chief John Ross and accompanied the Cherokee on their removal to the west. Henegar returned to Charleston and constructed his brick, Federal Style home in 1849. He and his wife Margaret Lea Henegar are buried with their family at Historic Ft. Hill Cemetery in Cleveland. The home (NR Listed 1976) was constructed at the site of the military barracks of Fort Cass. During the Civil War, the home was used as headquarters for Confederate and Union generals, including Gen. William T. Sherman. Located 2 blocks east of U.S. Hwy 11 between Cass and Water streets. (private residence; view from street) Note the Civil War Trails marker just north of the front gate. Built in 1860, this Greek Revival frame building served as the original home of the Charleston Cumberland Presbyterian Church. It features a portico with square Doric pillars displaying symbols of Apostles Matthew, Mark, Luke, and John. The simple interior includes a low dais and contains early pews made of poplar. Two small Sunday school meeting rooms were later added and wood paneling was installed in the 1950s. The churchyard was enclosed with a stone wall about 1910. During the Civil War military operations around Charleston, the church was used as a hospital by Federal Forces. Soldiers tethered their horses to the corner boards and window sills which still show deep scars made by the horses' teeth. Flowing between Bradley and McMinn counties. The Hiwassee River is the lifeblood of settlements in this area. Flowing from North Georgia, the 147-mile river is the first designated Scenic River in Tennessee and is dammed in three locations by the Tennessee Valley Authority (TVA). It flows through the Cherokee National Forest and passes the sites of the Cherokee Agency and Fort Cass before converging with the Tennessee River in Meigs County. The Hiwassee Wildlife Refuge is located in the confluence area. At the Agency, villages settled on the banks of the river. Ferry crossings carried people and goods across the river. The Agency, previously known as Walker’s Ferry, was a center for commerce and trade still attracting industries and development today. From Native Americans to industrial corporations and everyone between, the Hiwassee River is at the heart of this area’s stories.